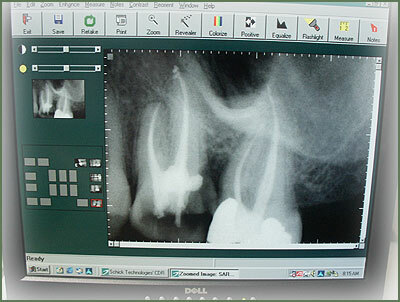 Because we have had advanced endodontic training and digital radiographics (eight second x-rays), we are able to, in most cases, finish a root canal in one short visit. The root canal is done with rotary nickel titanium files (not with the old hand files) and is filled with thermofill points on the same visit. This greatly reduces the incidence of post operative pain and infection.